The industrial city of Dudinka could become an important port for Russia as the Arctic melts. Situated some almost 200 miles above the Arctic Circle at the base of the Taimyr Peninsula, the town of Dudinka is the northernmost major seaport in Russia and the largest port in Siberia proper. As more and more of the Arctic Ocean remains ice-free year-round, Dudinka could play an important role in Russia’s plans to develop the Northern Sea Route for shipping. The Dudinka site was established in 1667 by Ivan Sorokin, a soldier from the Mangazeya fort on the distant Taz River. It was to serve as a post for gathering tribute, paid in furs, from local tribes in the Taimyr region. In the 18th century, the few log huts at Dudinka provided refuge for the explorers who took part in the Great Northern Expedition of 1733-1743, including Semyon Cheliuskin, Fyodor Minin and Khariton Laptev who, along with his cousin Dmitry Laptev, are the namesakes of the Laptev Sea. During the 19th and early 20th centuries, the outpost continued to offer a haven for intrepid explorers. In 1843, the noted zoologist Alexander Middendorf reached Dudinka during his expedition through the Taimyr Peninsula, and in 1875-1876, the Swedish-Finnish geographer Nils Adolf Erik Nordenskiöld used Dudinka as a temporary base during his exploration of the Taimyr. Other prominent explorers who stopped at the site include Fyodor Shmidt (1866), Fridtjof Nansen and Nikolai Urvantsev (1919). But vast distances and a forbidding climate prevented significant growth in the area. At the beginning of the 20th century, Dudinka had some 70 inhabitants at most living in primitive log huts with a small wooden church. Dudinka did not experience sustained development until the Soviet era. In 1930, it was designated the administrative center of the Taimyr Dolgan-Nenets National Region, the northernmost part of the Eurasian land mass. In the latter half of the 1930s, Dudinka became a critical point in the accelerated development of the Norilsk industrial complex, launched in 1935 by the Soviet Council of Commissars at one of the world’s richest sources of nickel and copper. In 1935, the renowned Soviet polar explorer Otto Shmidt visited the settlement and recommended that it be expanded into a town. By 1937, the Dudinka port facilities and a small railroad to Norilsk, 55 miles to the east, were completed. The production process at Norilsk, from the extraction of the ore to its processing in enormous smelting plants, was done almost entirely by forced labor from the Gulag. In addition to transporting massive industrial equipment, the Dudinka port served for two decades as the grim gateway for thousands of Gulag prisoners headed each year to the Norilsk camps. Some wooden buildings from that period still survive. To get to Dudinka, it is necessary to go by plane from Moscow or St.Petersburg to Norilsk airport and then take a taxi or minivan to Dudinka. In 1951, Dudinka was granted formal status as a town — an important step in separating the town administration from the complex of penal camps and factories. At that point it had 13,000 inhabitants. After the Norilsk camp system (Norillag) was closed in 1956, Dudinka served as the critical transportation nexus for the expanding city of Norilsk and its strategic factories. Imports and exports — including processed nickel and copper — continue to pass through the Dudinka port. Dudinka is the only major port that floods each year during the late spring thaw. Although the town is protected by its location on a high bluff, the port facilities are placed closer to the Yenisei’s normal water level. When the river ice breaks, the flow of water is impeded by titanic ice jams that spill onto the docks. In anticipation of this yearly phenomenon, the port cranes are moved on tracks to higher ground, where they are parked until the ice flows pass. But Dudinka is more than just the port. As the administrative center for the Taimyr region, Dudinka is home to numerous government agencies that monitor the Putorana Plateau, one of Russia’s largest unspoiled nature preserves, and the many native ethnic groups, including the Dolgan, Nenets, Nganasan, Enets and Evenk peoples, who make the Taimyr tundra their home. Dudinka not only provides educational, social and cultural services for these groups, but it also has a superb museum dedicated to regional history and the display of native cultures. Founded in 1937, the Taimyr Regional Museum began the study and collection of objects related to the life of indigenous peoples. In addition the museum collected the work of local artists. A new stage in the museum’s development occurred in April 2009 with the dedication of a large state-of-the-art building designed by the Krasnoyarsk architect Andrei Kuritsin. In 2011, this space gained a comprehensive exhibit of the region’s geology, biology, ecology, history and culture. Created as a collaborative effort between museum staff and the St. Petersburg design firm “Raritet,” the exhibits flow from the earliest geological displays through the complex social transformations of the 20th century. Among the displays is material on the Gulag period and the Great Fatherland War (1941-45). The architecture of Dudinka consists primarily of prefabricated concrete buildings that provide housing as well as commercial space. In addition to cultural and educational institutions, the town has a Russian Orthodox church, completed in 2000 on the bluff overlooking the port and dedicated to the Presentation of the Virgin Mary. Due partly to increased mechanization of the port, the population of Dudinka has declined from a peak of 32,000 in 1989 to its current 22,000. The climate is severe (temperatures as low as minus 59 degrees C.) with 45 days of polar night, balanced by 68 days in the summer when the sun does not dip below the horizon. 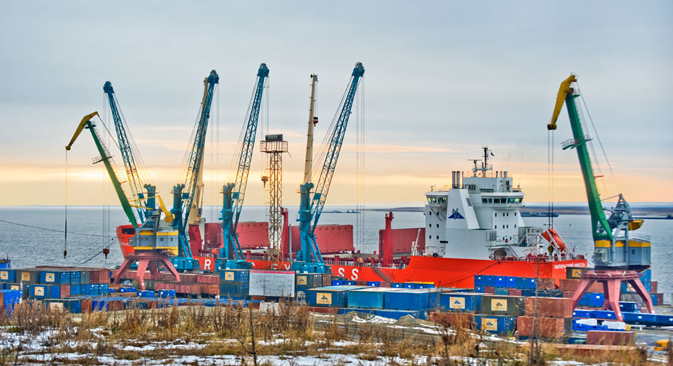 Nonetheless, the importance of Norilsk as a strategic industrial center and the increasing interest in the Arctic region bolster Dudinka’s status as a viable port. And the town’s remarkable museum will continue to serve as a center for the study and interpretation of one of the world’s great natural wonders, the Taimyr Peninsula.